Check out my poll below- I’d love to hear from you! what do you want to see more of from Ski Boots in the Kitchen? To roast beets, preheat oven to 375 degrees. Wash beets to remove any dirt, remove greens and stems from the beets so all the remains is the blub. To peel the beets prior to roasting use a vegetable peeler (or you can do this afterwards with your hands or paring knife- either way your hands will get pink unless you wear rubber gloves). Place beets on a large piece of foil and drizzle with olive oil and a pinch of salt. Make a little foil packet by sealing the top and sides by rolling the foil over itself. Roast for 25-30min or until you can easily pierce the beets with a fork. 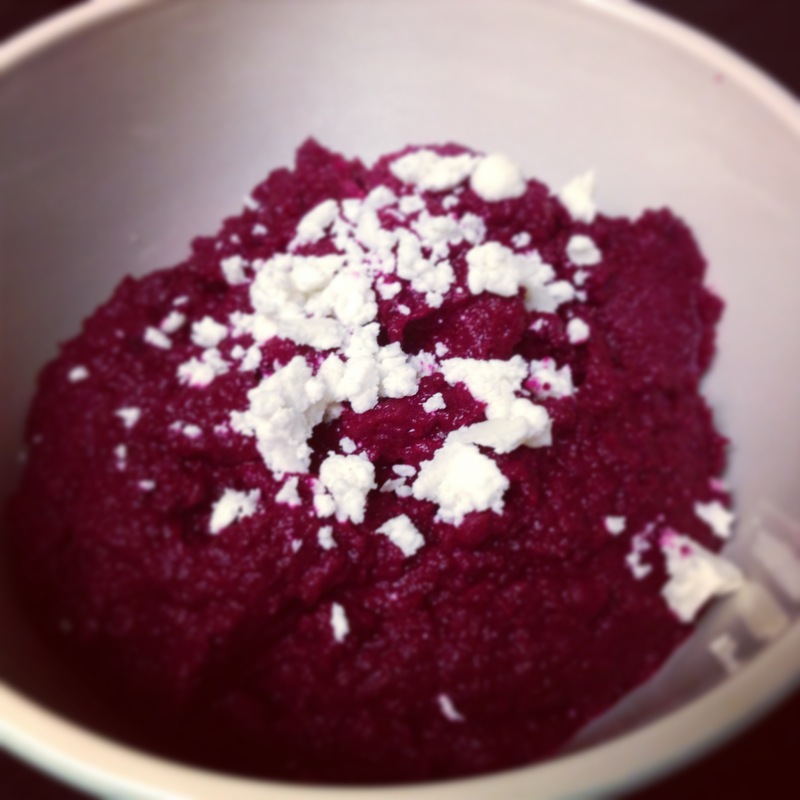 Combine beets, Tahini, chopped garlic, lemon juice, salt and pepper in a food processor or blender. Puree until smooth, scraping down the sides of your food processor (the Tahini gets stuck on the sides and bottom very easily). Add more lemon juice or a drizzle of olive oil until the dip reaches a desirable consistency (this is totally personal- add less liquid if you like your hummus thick and chunky or more liquid for it to be a bit thinner). Scoop dip into a bowl, crumble desired amount of goat cheese on top and serve with favorite chips! Enjoy! This entry was posted in Appetizers, Recipes, Sides and tagged Beet Dip, Beet Hummus, Beets, goat cheese, Roasted Beets by skibootsinthekitchen. Bookmark the permalink. Yum! 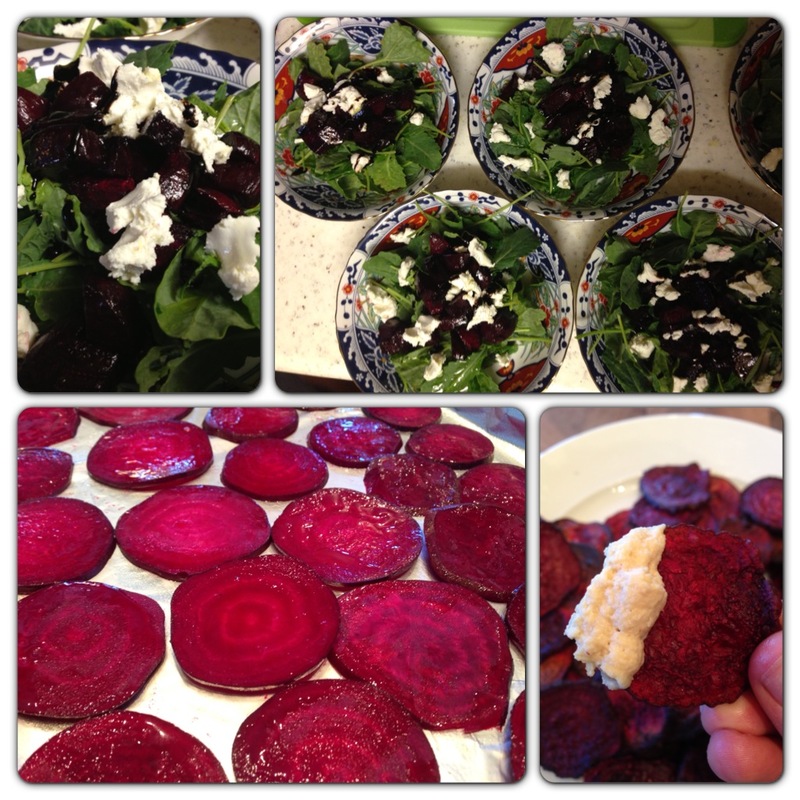 I love beets and goat cheese! Great easy recipe. I vote more everything!